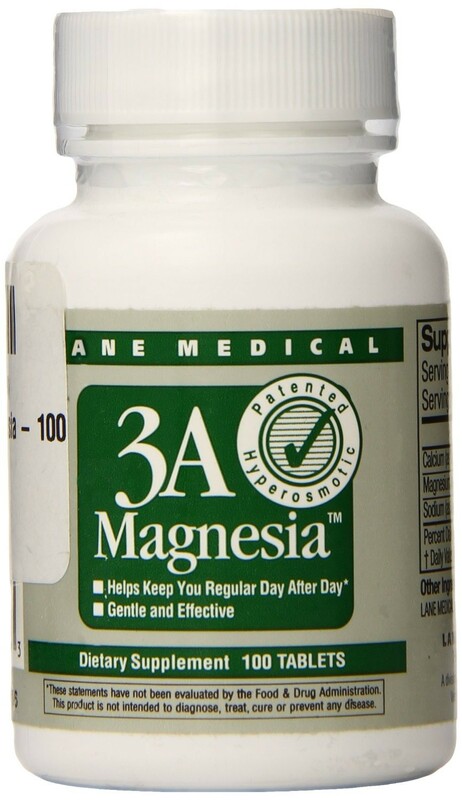 3A Magnesia is a simple, gentle, and very effective solution for constipation. It does not cause cramps, bloating, or discomfort; yet we have found it helpful in even the most stubborn cases of constipation. The key to regular, comfortable elimination is a soft stool. And there is no safer or more effective stool softener than water. 3A Magnesia is a "hyperosmostic", drawing water into the colon like a sponge. It has up to 4 times the water-trapping ability of standard magnesium. According to the manufacturer, 3A Magnesia is not only safe to take daily, but is a good source of magnesium. Small tablets are easy to swallow and very gentle on the system. Sodium Croscamellose (4 mg of sodium), Microcrystalline Cellulose, Menthol. Suggested use: For Daily Regularity: Take 2 tablets with water nightly before bed. For Occasional Overnight Relief: Take 6 tablets with water before bed.